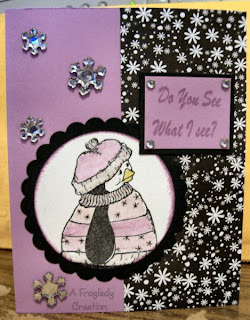 Stamping Stuff: Do you see what I see? Ok so this penguin in particular is growing on me LOL! So much in fact the cards I am making for one of my "assignments" I DON'T want to part with! YIKES this could be a bit problematic! LOL This set is called Be Naughty and is from FireCracker Designs by Pamela. I really like the flexibility of this sketch and since the penguin is turned up a bit I moved the sketch around to accommodate that. Paper is from SU and DCWV. Inks are Palette and then my SU Blender pen to color in the sweater and beak with them. I also added a bit of Prisma WaterColor pencils to the one band to give it a slight color variance. Then some stickles for a little dazzle LOL! The snowflakes and the little corner gemstones were a misc sheet I found in my Christmas drawer of goodies. If you aren't already a member of PCP then you ought to go check it out! It is the newest and hottest place out there for crafters! Its cute! I love the color combo you used. This is soooo sweet! LOve that image and your design is FABULOUS! TFS! Ohhh how cute, I love your card! 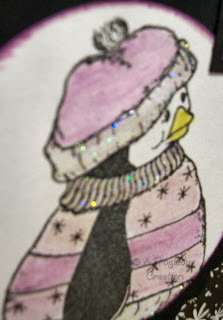 I don't know what has happened to Dinky Dots, the blog has gone and you can't get on to there website. I hope you get your order! Way cute card! love the black/purple color combo.